I love bananas. That’s not to say that you have to love bananas just because I do, but once you find out more about this tropical delight you might enjoy eating them just a wee bit more. So let’s peel away and get right down to the core of this yummy yellow fruit! First of all, I want to mention something I’ve always found interesting about bananas. Are you ready?? They grow upside down. Okay, maybe that’s kind of a letdown. Maybe you already knew that, or it doesn’t really do much for you, it’s just kind of like, ‘OK, whatever;’ but I find it interesting. Of course, whether it grows upside down or right side up depends on what end of the banana you consider the top to begin with. I’ve always considered the top to be the end that attaches to the rest of the bunch of bananas – the end with the long skinny nose. So, if you think like me (and remember, great minds think alike! ), then yes, bananas grow upside down, and yes, they grow on trees; banana trees, beautiful, luscious, tropical banana trees. As seen in Hawaii. Anyway, I guess it’s about time I get into the nutritional aspect of bananas. When you eat a banana, a complex cycle of events occur within your body. I’m not going to go into detail, but between the time a banana goes in and out of your body, the tryptophan contained in the banana is converted into serotonin, a neurotransmitter. This makes you feel happy, much like endorphins (also neurotransmitters) that are produced when you exercise, experience excitement, etc. 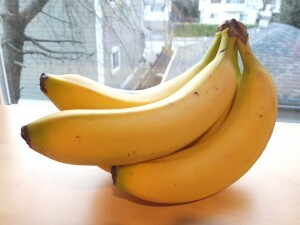 There are so many great aspects of bananas that contribute to overall health. They naturally protect against type 2 diabetes, macular degeneration, and kidney cancer, and help with weight loss. This super spectacular fruit also acts as a digestive aid, removing toxins and heavy metals from the body due to its high pectin content. The vitamin B-6 in bananas increases production of white blood cells, and the iron they contain strengthens blood and can help relieve anemia. In addition, bananas help restore electrolytes after diarrhea and, since they are high in fibre (as are most fruits and vegetables), they promote bowel mobility. One consumed, bananas behave like prebiotics. This basically means that they promote the growth of good flora in your gut, which aid digestion. Bananas not only stimulate gut bacteria, but good bowel bacteria as well, and produce digestive enzymes that help you absorb nutrients, thus soothing the digestive tract. Not only are bananas great for preventing muscle cramps, they also contribute to bone health because they lessen calcium loss during urination. This helps keep your bones strong and is especially important for children as they need enough calcium for their bones to grow properly. This entry was tagged acid reflux, alertness, anemia, bananas, blood sugar, bone, depression, fibre, gut flora, health benefits, heart attack, heartburn, kidney cancer, learning, macular degeneration, muscle, muscle cramps, potassium, prebiotic, stress, stroke, swelling, type 2 diabetes, weight loss. Bookmark the permalink.